Play resumed on the opening day after rain had interrupted the proceedings of one-off Test between India and Afghanistan at the M Chinnaswamy stadium. 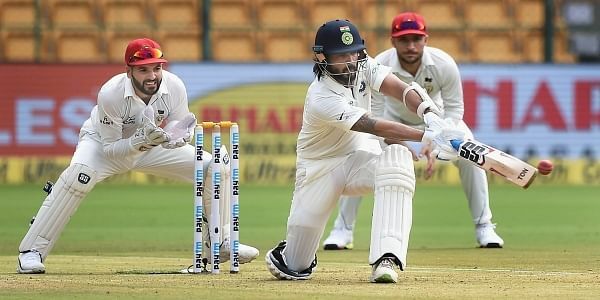 BENGALURU: Play resumed on the opening day after rain had interrupted the proceedings of one-off Test between India and Afghanistan at the M Chinnaswamy stadium here today. Murali Vijay (94) and KL Rahul (33) were at the crease with India at 248 for one in 45.1 overs when heavens had opened up. With rain lashing the stadium, India took early tea. However, it begun drizzling again after tea and about 59 minutes of play was lost. Brief Score: India: 248 for one in 45.1 overs (S Dhawan 107; Y Ahmadzai 1/28).